Permafrost is soil, typically beneath the surface, that has remained or below the freezing point of water for two or more years. Ice is not always present, but it frequently occurs, and it may occur in amounts exceeding the ability of the soil to hold water. Most permafrost is located in land close to the North and South poles, but permafrost also exists in some mountains in much lower latitudes. Permafrost accounts for 0.022% of total water and exists in 24% of exposed land in the Northern Hemisphere. A considerable area of the Arctic is covered by permafrost. The subsoil in tundra regions is typically permafrost. Lying on top of permafrost there is a thin layer of soil that thaws during the summer. Plant life can be supported only within this ‘active layer’, since growth can occur only in soil that is fully thawed for some part of the year. The thickness of the active layer varies, but it’s typically 0.6–4 meters thick. The depth of the permafrost can be as much as 1,400 meters — such depths are found in the northern Lena and Yana River basins in Siberia. If the mean annual air temperature is only slightly below freezing, permafrost will form only in spots that are sheltered — usually with a northerly aspect. This creates what is known as discontinuous permafrost. Usually, permafrost will remain discontinuous in a climate where the mean annual soil surface temperature is between -5 and 0 °C. In areas with moist winters, where the snow forms an insulating blanket, such as in Northern Scandinavia and the North-Eastern part of European Russia west of the Urals, there may not be even discontinuous permafrost down to −2 °C. At mean annual soil surface temperatures below −5 °C, the influence of aspect can never be sufficient to thaw permafrost, and a zone of continuous permafrost forms. 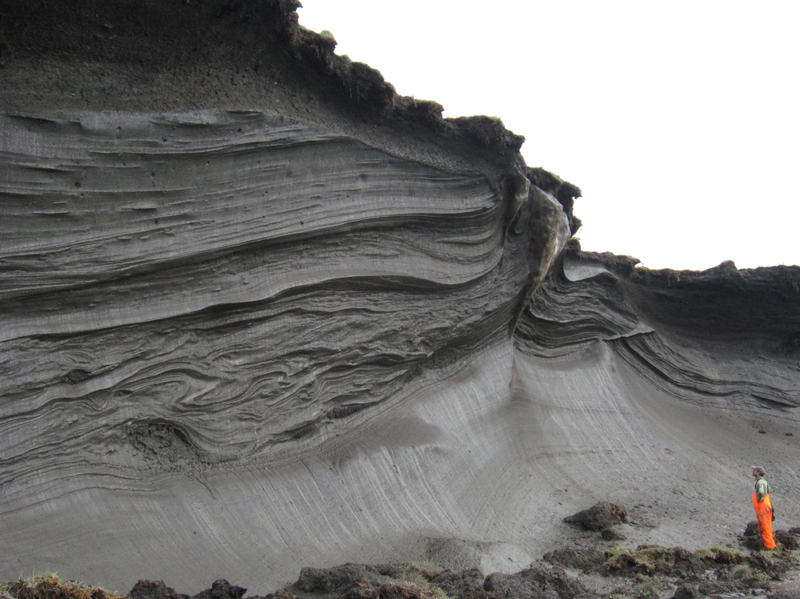 In the Northern Hemisphere, a line of continuous permafrost is formed from the most northerly points at which permafrost sometimes thaws or is interrupted by regions without permafrost. North of this line all land is covered by permafrost or glacial ice. This lies further north at some longitudes than others and can gradually move northward or southward due to regional climatic changes. • C. Tarnocai, J. G. Canadell, E. A. G. Schuur, P. Kuhry, G. Mazhitova, and S. Zimov, Soil organic carbon pools in the northern circumpolar permafrost region, Global Biogeochemical Cycles 23 (2009), GB2023. Abstract: The Northern Circumpolar Soil Carbon Database was developed in order to determine carbon pools in soils of the northern circumpolar permafrost region. The area of all soils in the northern permafrost region is approximately 18,782 × 103 km2, or approximately 16% of the global soil area. In the northern permafrost region, organic soils (peatlands) and cryoturbated permafrost-affected mineral soils have the highest mean soil organic carbon contents (32.2–69.6 kg m-2). Here we report a new estimate of the carbon pools in soils of the northern permafrost region, including deeper layers and pools not accounted for in previous analyses. Carbon pools were estimated to be 191.29 Pg for the 0–30 cm depth, 495.80 Pg for the 0–100 cm depth, and 1024.00 Pg for the 0–300 cm depth. Our estimate for the first meter of soil alone is about double that reported for this region in previous analyses. Carbon pools in layers deeper than 300 cm were estimated to be 407 Pg in yedoma deposits and 241 Pg in deltaic deposits. In total, the northern permafrost region contains approximately 1672 Pg of organic carbon, of which approximately 1466 Pg, or 88%, occurs in perennially frozen soils and deposits. This 1672 Pg of organic carbon would account for approximately 50% of the estimated global belowground organic carbon pool. • Kevin Schaefer, Tingjun Zhang, Lori Bruhwiler, Andrew Barrett, Amount and timing of permafrost carbon release in response to climate warming, Tellus B 63 (2011), 165–180. Abstract: The thaw and release of carbon currently frozen in permafrost will increase atmospheric CO2 concentrations and amplify surface warming to initiate a positive permafrost carbon feedback (PCF) on climate. We use surface weather from three global climate models based on the moderate warming, A1B Intergovernmental Panel on Climate Change emissions scenario and the SiBCASA land surface model to estimate the strength and timing of the PCF and associated uncertainty. By 2200, we predict a 29–59% decrease in permafrost area and a 53–97 cm increase in active layer thickness. By 2200, the PCF strength in terms of cumulative permafrost carbon flux to the atmosphere is 190 ± 64 Gt C. This estimate may be low because it does not account for amplified surface warming due to the PCF itself and excludes some discontinuous permafrost regions where SiBCASA did not simulate permafrost. We predict that the PCF will change the arctic from a carbon sink to a source after the mid-2020s and is strong enough to cancel 42–88% of the total global land sink. The thaw and decay of permafrost carbon is irreversible and accounting for the PCF will require larger reductions in fossil fuel emissions to reach a target atmospheric CO2 concentration. Joseph Romm, NSIDC bombshell: Thawing permafrost feedback will turn Arctic from carbon sink to source in the 2020s, releasing 100 billion tons of carbon by 2100, Climate Progress, 17 February 2011. We predict that the PCF (permafrost carbon flux) will change the Arctic from a carbon sink to a source after the mid-2020s and is strong enough to cancel 42-88% of the total global land sink. 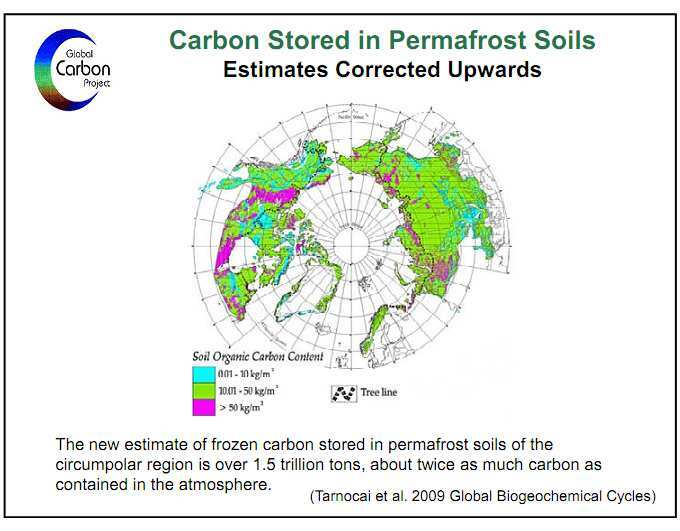 The thaw and decay of permafrost carbon is irreversible and accounting for the PCF will require larger reductions in fossil fuel emissions to reach a target atmospheric CO2 concentration. Now, permafrost is thawing in a warming climate and “just like the broccoli” the biomass will thaw and decay, releasing carbon into the atmosphere like any other decomposing plant material, Schaefer said. To predict how much carbon will enter the atmosphere and when, Schaefer and coauthors modeled the thaw and decay of organic matter currently frozen in permafrost under potential future warming conditions as predicted by the Intergovernmental Panel on Climate Change. They found that between 29-59 percent of the permafrost will disappear by 2200. That permafrost took tens of thousands of years to form, but will melt in less than 200, Schaefer said. The authors assume the ‘moderate warming’ scenario called A1B, which has atmospheric concentrations of CO2 reaching 520 ppm by 2050 and stabilizing at 700 ppm in 2100. But so far we seem to be living out the A1F1 scenario, which reaches 1000 ppm by century’s end. Their estimate of future temperatures neglects the effect of greenhouse gases released by melting permafrost. They assume all carbon emitted by permafrost will be in the form of CO2, not methane. Countless studies make clear that global warming will release vast quantities of greenhouse gases into the atmosphere this decade. Yet, no climate model currently incorporates the amplifying feedback from methane released by a defrosting tundra. If we try to understand this feedback, point 3) becomes important. After all, while methane goes away faster than CO2, its greenhouse effect is much stronger while it lasts. For the first 20 years, methane has about 72 times the global warming potential of carbon dioxide. Over the first 100 years, it’s about 25 times as powerful. The implications are worth pondering. In 2008, we burnt about 8 gigatonnes of carbon. If Schaefer et al are right, we can expect 1 extra gigatonne of carbon to be released from Arctic permafrost by around 2035. If that’s almost all in the form of carbon dioxide, it makes our situation slightly worse. But if a lot of it is methane, which is—let’s roughly say—72 times as bad—then our situation will be dramatically worse. However, there are some important question. How much carbon released will be in the form of methane? And: how much of the methane will turn into other organic compounds before it gets into the atmosphere? Abstract: Arctic climate change is leading to accelerated melting of permafrost and the mobilization of soil organic carbon pools that have accumulated over thousands of years. Photochemical and microbial transformation will liberate a fraction of this carbon to the atmosphere in the form of CO2 and CH4. We quantified these fluxes in a series of permafrost thaw ponds in the Canadian Subarctic and Arctic and further investigated how optical properties of the carbon pool, the type of microbial assemblages, and light and mixing regimes influenced the rate of gas release. Most ponds were supersaturated in CO2 and all of them in CH4. Gas fluxes as estimated from dissolved gas concentrations using a wind-based model varied from 220.5 to 114.4 mmol CO2 m22 d21, with negative fluxes recorded in arctic ponds colonized by benthic microbial mats, and from 0.03 to 5.62 mmol CH4 m −2d −1m^-2 d^-1. From a time series set of measurements in a subarctic pond over 8 d, calculated gas fluxes were on average 40% higher when using a newly derived equation for the gas transfer coefficient developed from eddy co-variance measurements. The daily variation in gas fluxes was highly dependent on mixed layer dynamics. At the seasonal timescale, persistent thermal stratification and gas buildup at depth indicated that autumnal overturn is a critically important period for greenhouse gas emissions from subarctic ponds. These results underscore the increasingly important contribution of permafrost thaw ponds to greenhouse gas emissions and the need to account for local and regional variability in their limnological properties for global estimates. Edward A. G. Schuur et al, Vulnerability of permafrost carbon to climate change: implications for the global carbon cycle, Bioscience 58 (2008), 701-714. Amanda Leigh Mascarelli, A sleeping giant?, Nature Reports Climate Change, 5 March 2009. It also discusses the dangers of methane being released from ice-methane crystals called methane clathrates at the bottom of the ocean. T. S. Sazonova, V. E. Romanovsky, J. E. Walsh, and D. O. Sergueev, Permafrost dynamics in the 20th and 21st centuries along the East Siberian transect, Journal of Geophysical Research - Atmospheres, 109 (2004), D01108. Abstract: The East Siberian transect, which has been designated by the International Geosphere-Biosphere Program (IGBP) as its Far East transect, has unique permafrost conditions. Not only does permafrost underlie the entire transect, but also about one third of the region is underlain by an “ice complex,” consisting of extremely ice-rich Late Pleistocene sediments. Given the possibility of a predicted future increase in global temperatures, an evaluation of the magnitude of changes in the ground thermal regime becomes desirable for assessments of possible ecosystem responses and impacts on infrastructure. A soil model developed at the Geophysical Institute Permafrost Laboratory was used to simulate the dynamics of the active layer thickness and ground temperature in this transect, both retrospectively and prognostically, using climate forcing from six global climate models (GCMs). Analysis of future permafrost dynamics showed that within the southwestern part of the transect, widespread permafrost thawing from the surface can begin as early as 2050. The spatial extent and temporal dynamics of the zone with thawing permafrost vary significantly among the different GCMs. According to all the GCMs the mean annual ground temperatures could rise by 2°–6°C, and the active layer thickness could increase by 0.5–2 m everywhere within the transect by 2099. However, the increases in mean annual ground temperature and active layer thickness are not uniform in time. Relatively cold and warm periods associated with natural fluctuations in air temperature and precipitation are superimposed on the background warming trend. The most significant increases in mean annual ground temperatures and in the active layer thickness are projected to occur in the southwestern part of the transect and in areas with coarse-grained sediments, characterized by low water content and high thermal conductivity. Andrew Prince, Washing away the Arctic coastline, National Public Radio, 9 April 2011. Two-thirds of the Arctic coastline is made of permafrost — an environment that is very sensitive to warming temperatures. A new report says erosion is causing these coastline regions to recede by an average of 1.5 feet per year. 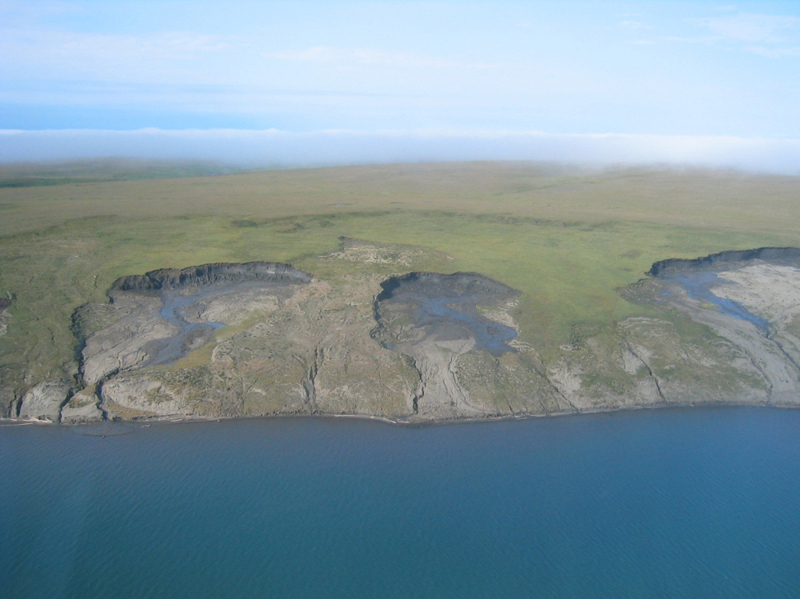 Unlike rock shoreline, permafrost loses its structure when it warms above freezing. “Surface air temperatures have reached record levels over the past decade,” the report from an international consortium found. Combine this with weakened permafrost and there’s a recipe for erosion. Heightened temperatures have also melted sea ice; with this gone, wind can whip up stronger waves that are able to erode the softened Arctic coastline. Researchers studied more than 62,000 miles of Arctic coast and analyzed climate data. Northwestern Canada and Northeastern Russia showed the largest changes: coastlines there have receded by as much as 25 feet per year. Researchers say these changes will have a major impact on Arctic ecosystems. Forbes, D.L. editor, State of the Arctic Coast 2010 – Scientific Review and Outlook, International Arctic Science Committee, Land-Ocean Interactions in the Coastal Zone, Arctic Monitoring and Assessment Programme, International Permafrost Association. Helmholtz-Zentrum, Geesthacht, Germany, 2011, 178 pp. Arctic methane deposits, Azimuth Library.